I am having some success of late with luring Ran back to blogging (or at least modelling), something made easier by finding him some must-have clothing by new-to-us brand Last Ride. And as it happened, I also had this rather impressive piece of furniture by Noble Creations to show off. The Round Table by Noble Creations is an imposing stone table (with some maps and a letter laid out on it) that comes with wooden chairs in two tones and two subtly different styles. 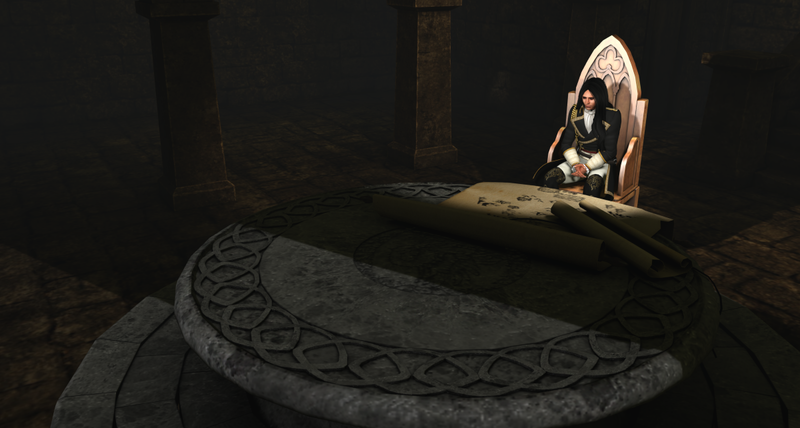 This is a table for a king or a general planning his latest campaign or brooding over the current one. I found this dashing mesh outfit (more like this, please!) thanks to a Plurk that alerted my attention to the KIRA KIRA - Twinke Star Party event. 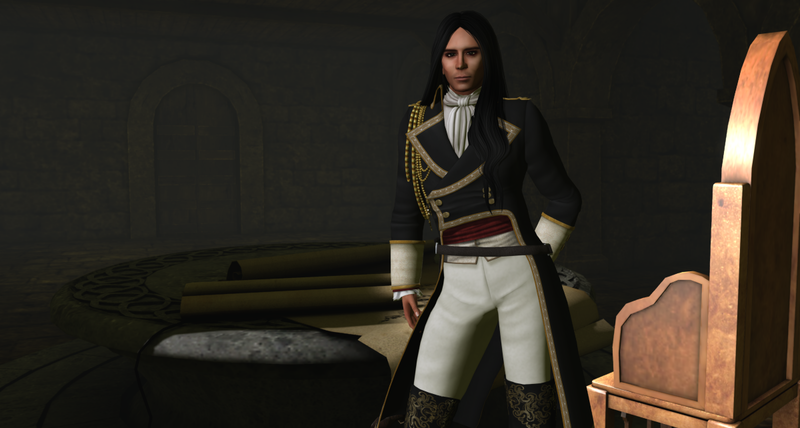 Last Ride is a brand without a store, largely releasing new items for events, so if you like the look of the Marquis outfit (available with a black or a white jacket, at L$200 each) you need to get over there and demo it. The outfit comes in three sizes; small, medium and large. Worn with the outfit is the embroidered boots by lassitude & ennui and the creator behind Last Ride offered a very clever and innovative way to make his mesh pants work with boots. The legs are made with multiple faces, allowing you to set one face at a time transparent and thus “shortening” the pant leg one chunk at a time. It won’t match precisely with all boot heights, of course, but it is a huge step up from having no control at all over the length of the mesh pant. Ran is again wearing the Rufus skin by Birth and the long hair is Jaden by Wasabi Pills.